Awww yeah! This is a bitter sweet book reveal. Feast your eyes dear readers, on my debut e-novel BLOOD & HONOR, a martial arts story set in a fantasy-inspired Qing Dynasty, China, during the reign of the Qianlong Emperor. This is a fantastical tale of swords and magic, peasants and noblemen, oppressors and monks striving to find their individual paths and protect their secrets. I’m enthralled by the dazzlingly beautiful cover art professionally rendered by amazing artist Lora Gray. Click on the link and be transported to her deviantArt gallery ljeves.deviantart.com. You’re welcome. Awakened by the clanging of swords one summer night, sixteen-year-old martial artist and accomplished swordswoman Xiao Meiying finds her father Yong dueling with a masked intruder who has come to steal the Blood heirloom sword, one of a matched pair. 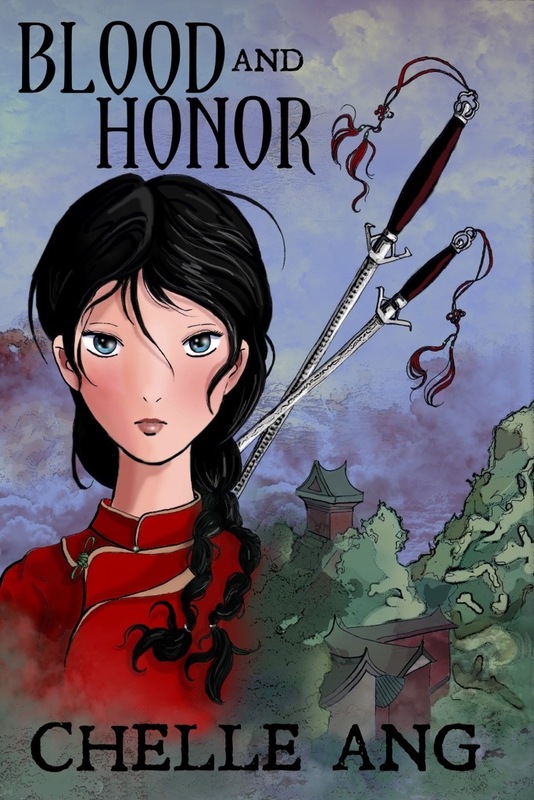 After father and daughter thwart the thief’s intentions, Meiying, against her father’s wishes, sets out to find the Honor sword, which has been lost since her mother’s death years before. Her journey toward Wudang Temple on Wudangshan Mountain leads her through the treacherous jiānghú (martial arts world), where she battles Pan Lei, a dangerous young man from her past. Though the pair are at odds, since each seeks to possess both the Blood and Honor swords, Meiying and Lei find themselves inexplicably drawn to each other. And it will take them finally working together to rescue Meiying’s father and her uncle, who have been captured by Yu Tai, a villainous warlord intent on claiming the swords – and their powers – for himself. BLOOD & HONOR is available now on Kindle, Nook, and Kobo. This entry was posted in Books, new release and tagged China, FANTASY, magic, MARTIAL ARTS, Qing dynasty, sword and sorcery, Wuxia, YA fantasy. Bookmark the permalink.